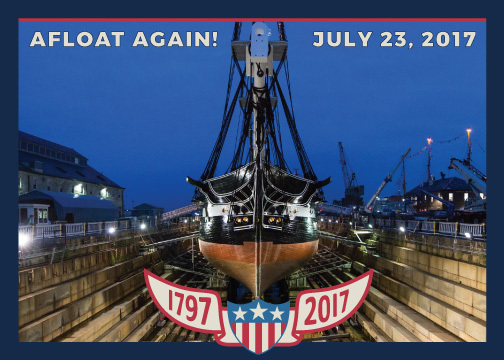 After 26 months in dry dock, USS Constitution was successfully re-floated into Boston Harbor on the night of July 23-24, 2017 and has returned to her regular berth at Pier 1 West in the Charlestown Navy Yard. “Old Ironsides” is not scheduled to enter dry dock again for another 20 years. To learn more, visit our Museum Blog and check out ConstitutionCam, a live photo-feed of USS Constitution. Visit our blog for regular posts on a variety of topics related to the history of USS Constitution, research at the museum, and ongoing work on the Ship. Check out our live photo feed of USS Constitution. The activity that is the subject of Restoring an Icon and ConstitutionCam has been financed in part with Federal funds from the National Maritime Heritage Grant program, administered by the National Park Service, U.S. Department of the Interior, through the Massachusetts Historical Commission, Secretary of the Commonwealth William Francis Galvin, Chairman. However, the contents and opinions do not necessarily reflect the views or policies of the Department of the Interior, or the Massachusetts Historical Commission, nor does the mention of trade names or commercial products constitute endorsement or recommendation by the Department of the Interior, or the Massachusetts Historical Commission.